The name Simmons chose for his new label reflected the fusion of the new music he promoted: "def" was hip-hop slang for cool, while "jam" referred to the freewheeling breakouts of classic jazz. Hip-hop's master impresario brought marginalized voices to a mass audience -- and cross-marketed a youth cultural movement in music, comedy, fashion, poetry, and social action. Born to middle-class parents in 1957, Russell Simmons grew up in Queens, New York. He flirted with gang life, but changed his focus after he heard rap music. In the mid-1970s, its arresting, novel sound -- just beats and rhymes -- was emerging from New York's grimmest African American neighborhoods. As a promoter, Simmons started organizing concerts and managing the inner-city artists, but the music industry paid no heed. Its executives considered the 1979 smash, "Rapper's Delight," a one-time novelty. Not until 1983, when Simmons helped form the group Run-DMC, would rapping -- now part of a broader cultural phenomenon called hip-hop -- reach the mainstream. Rapper Chuck D would describe hip-hop as black America's C.N.N., a network for news about life in America that was not being reported elsewhere. The members of Run-DMC wanted to "keep it real." Unlike other black performers, who had adopted white manners and fashions to find success, they remained true to themselves in their styles, their diction, and their choice of rhymes. At Simmons' urging, they wrote a paean to their sneakers -- "My Adidas." It brought the German company's executives running, checkbooks open. Simmons signed unknowns to Def Jam, the record label he started with producer Rick Rubin. Many of those artists, like Public Enemy, Kurtis Blow, Slick Rick, and LL Cool J, became famous. Hip-hop reached the record-buying masses. White, suburban youth grew fascinated by black urban culture. If white parents started to wonder why their children were "acting black," the answer was simple: Russell Simmons had made it cool. Simmons stood at the center of hip-hop's growth, making sure his performers followed the money. He lobbied MTV to air Run-DMC videos, and had the rappers record a song with Aerosmith, a well-known white rock band. He signed a group of white rappers, the Beastie Boys, helping broaden the movement. He welcomed white audiences, defining hip-hop as a youth culture, not a race-based one. When fashion designers co-opted hip-hop styles, he created his own clothing line, Phat Farm; it would grow into a $140 million business. 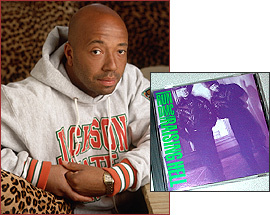 In 1985, he inked a music distribution deal with CBS worth $600,000. Fourteen years later, Universal would buy Def Jam for $120 million. Simmons took his promotion of African American creative talent to television, producing a cable program, "Russell Simmons' Def Comedy Jam." It ran for seven years, launching a generation of black comedians including Bernie Mac, Chris Rock, and Martin Lawrence. In 2001, he started "Russell Simmons' Def Poetry Jam," a similar proving ground for young poets. His next project: social action, through philanthropy and political involvement. Russell Simmons took the cultural expression of an impoverished minority and innovated it as a business; by harnessing its economic power, he made it a pervasive element of contemporary life. Dozens of black artists found a national audience, in a movement that not only generated wealth, but also changed America's understanding of itself. As Simmons once said, describing the diversity among African Americans, "the truth is that everybody doesn't look like Bill Cosby, and we need to hear the truth, and see the truth, in order for us to know where we're going, and what our problems are."